← Keep an eye on your hives! I speak from experience, a recent one. 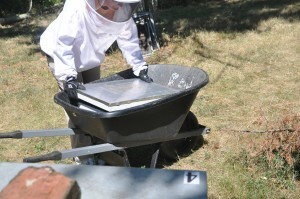 A new task for novice beekeepers this time of year may be removing honey supers from the hives. Actually, removing them is pretty easy – just stick your hive tool under the corner of the honey super, break the seal (bees ALWAYS have it glued to whatever is underneath) and lift the super off. The trick is to get the bees out of the supers before you pry them off and to keep them out while getting the supers out of the apiary. 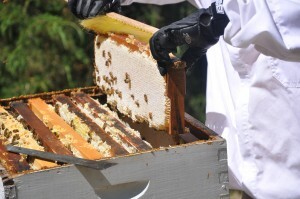 There are four methods commonly used by beekeepers to separate the bees from the honey. I’m going to concentrate on the last two methods, but briefly discuss the first two. Bee blowers are sometimes used by beekeepers to literally blow the bees out of the honey supers. It sounds pretty rough, but the bees don’t seem to suffer any ill effects, and do not go nuts as you might expect. (They’re disoriented, but not mad). Dadant has made a gasoline powered bee blower for years, but the purchase cost is over $500. I have, in the past, used a leave blower for this purpose as do some other beekeepers. 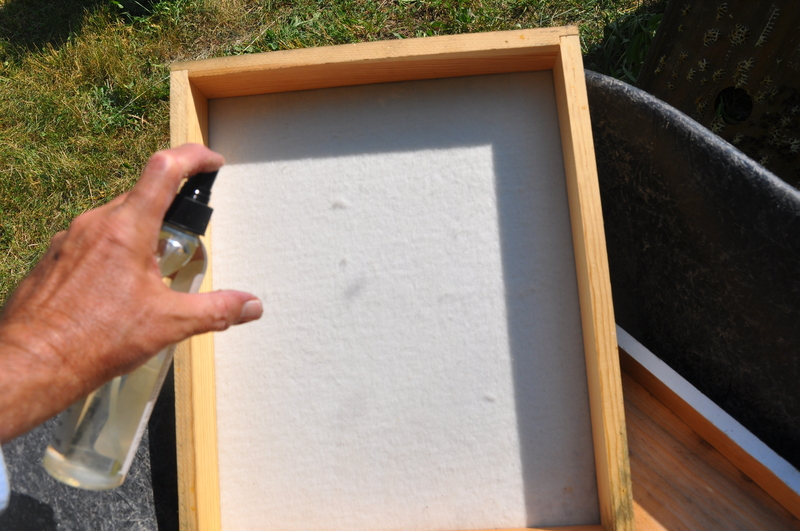 However, I decided a while ago that I don’t like the noise in my apiary, and now I always use an alternative method. Blowing bees is most often practiced by beekeepers with more than a couple of dozen hives and is best performed by more than two people. If folks are interested in learning more about the blowing method, let me know, and I’ll ask a friend who uses it to write a guest post sometime in the future. 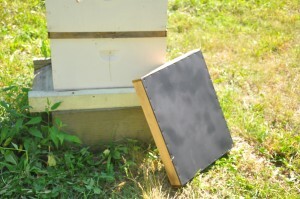 Bee escapes are devices placed under the honey super which act as a one way doors for the bees, allowing them to exit, but not to return. There are a couple of different designs. One is a series of triangles (shown below) and the other looks somewhat similar, but consists of a row of small cones (like the ones your doctor uses to look in your ear). You can also purchase a small bee escape device that fits into the hole in traditional inner covers. Those are the cheapest, but they allow only a single path for the bees; the other devices offer several. The honey super is placed over the escape. Note that the picture below shows the escape UPSIDE DOWN. 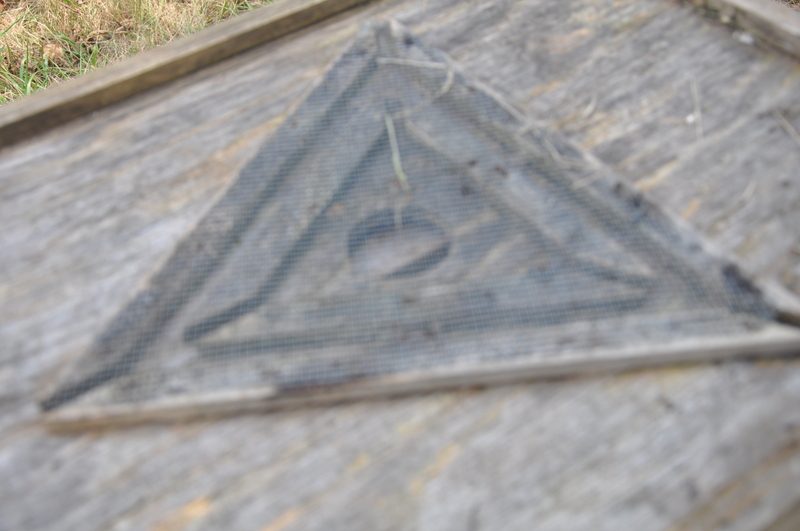 In use, the triangles would be underneath, with only a round hole showing in the surface that is in contact with the honey super. The bees exit through the simple maze of triangles and cannot find their way back. One problem with bee escapes is that they work best when the weather is warm enough during the day to open the hives, but cool enough at night to encourage bees to leave the supers and join the main cluster below. If you live in an area where you do not harvest until late September or October (New England? ), they may work well for you. My experience here in Kentucky is that the bees are slow to move out of the supers in the summer, meaning that bee escapes need several days to work and may still leave some bees on the honeycomb. Though I know that some Kentucky beekeepers use them and are happy with the results, I do not recommend their use during warm weather, especially in mid-summer. 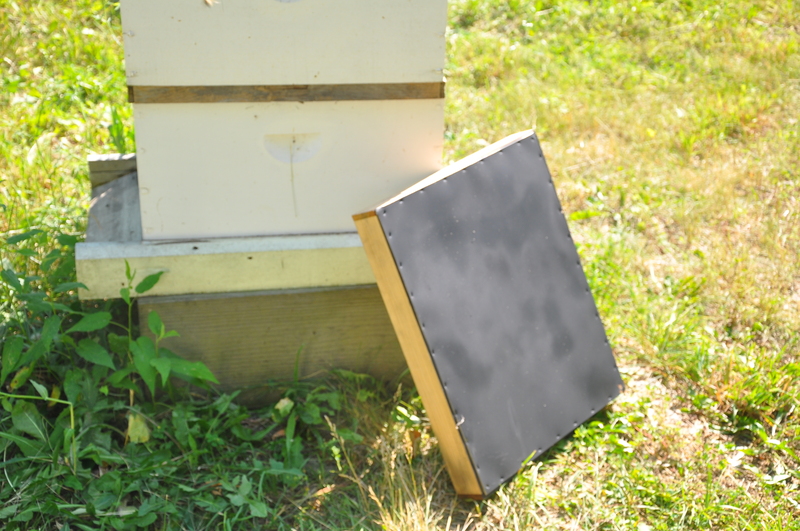 Another disadvantage to bee escapes is that it is a two step operation. The supers must be moved in order to place the escape under them, and then removed several days later. My back is old and my honey supers are heavy, so I don’t like to handle them more than once. It is also IMPERATIVE to stop up any holes to make sure that bees cannot get into the supers except through the hive entrance. Failure to do this will not only make the escapes ineffective, but can also lead to robbing by bees from other hives. 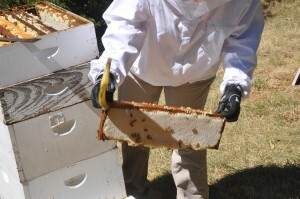 First, decide ahead of time how you are going to move the honey from your apiary to indoors. This may be in a wheelbarrow or cart, in the back of a pick-up truck, in an automobile (don’t leave it in a hot trunk for more than a few minutes), or even by hand. 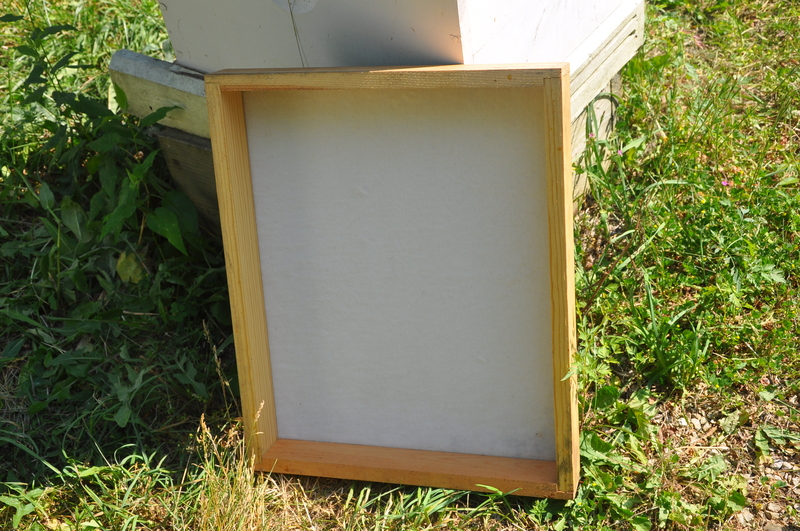 I highly recommend having an empty honey super on hand, into which the frames of honey can be placed once they are free of bees. 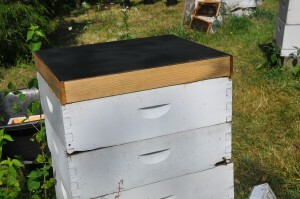 The empty super should be made “robber proof” by the use of a hive cover, tarp, or piece of plastic. Have your mode of transportation and/or empty super nearby. You don’t want to carry each frame a hundred feet. When removing more than a super or two, it’s good to have a helper. 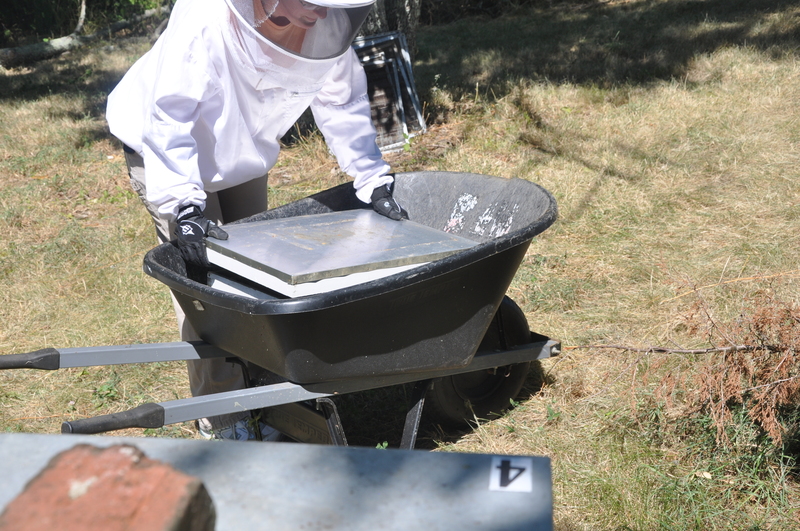 One person lifts out the frames, removes the bees, and hands them to the second who places them in the extra super. Light your smoker and have the bee brush handy. Remove the hive cover(s), lightly smoke the entrance and the top of the hive. 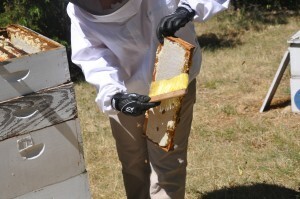 Use your hive tool to remove the first frame. Give the frame a vigorous shake (or two) over the hive entrance (not over the super – you only want to remove the bees once). While holding the frame in one hand (you can partly support it on the edge of the front honey super), gently brush ALL the bees from the super in the direction of the entrance. 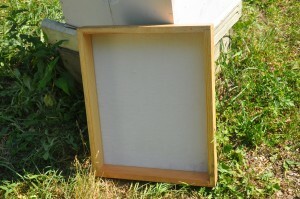 Place the “bee free” frame into the empty super and cover it. Repeat until the super on the hive is empty. It can now be used to receive more frames if you have more than one super to remove. Bee repellants such as Bee Go or Bee Quick can be usefull if you have more than a few supers of honey ready to be extracted. This is probably the most common method of getting bees out of supers, used both by hobbyists and by commercial beekeepers with thousands of hives. It is the one I use as well. 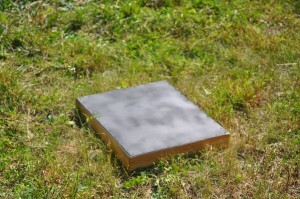 The use of repellants requires a fume board, a device which looks similar to an outer cover, but which has felt on the inside to which the repellant is applied. Be aware that Bee Go, while very effective, has a strong, noxious odor. Bee Quick and some other repellants are less unpleasant, but Dawn, a friend and beekeeper who helped me pull honey recently (and who appears in these photos), found even the Bee Quick rather overpowering). The big advantage to repellants is that you remove the bees from an entire super at once and then simply remove the super (now theoretically void of bees). I say theoretically, because I often fail to get every bee out. Perhaps I get impatient- you might do better. Prepare as in the shaking and brushing method, but you will not need an empty honey super or a bee brush. I like to place my fume board in the sun as I get ready; this heats it up ahead of time. Note that the aluminum on my fume board is black. They don’t come that way. I spray paint them (I sometimes use more than one) – using flat black spray paint. The dark color absorbs heat and makes them more effective. I may smoke the entrance lightly, but there is no need to smoke the honey super. 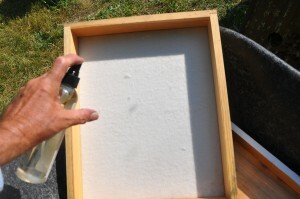 Spray the repellent onto the felt side of the fume board (see the directions that come with the repellant that you are using). If using Bee Go, be careful not to spray it on your clothing! Remove the cover(s) from the hive. (You could break the seal on the super at this point to make it easier to remove after you use the fume board.) Place the fume board, felt side down, over the super. In about five minutes the bees should have exited the super. You can take a peek after a couple of minutes to see if it looks as though they are going out. If bees start boiling out of the hive entrance, you used too much repellant. When that happens, go ahead and remove the fume board (the bees are probably all out of the super), and use less next time. The chemical and the smell will dissipate after a few minutes. Remove the honey super and protect it from robber bees. If you have another super on the same hive, repeat the process. You’ll need to reapply some repellant. A note on robbing: If there is not a nectar flow going on, the presence of exposed honey in your apiary will attract robber bees (see post on robbing) and may cause wide scale robbing to break out. Be careful about leaving honey out or leaving hives with their covers off very long. It might be best to move each super indoors after it is pulled, depending how quickly you can remove it. If you do see signs of robbing, stop pulling honey – the robbing will just get worse if you don’t – and return another day. Grass stuffed loosely in the entrances of hives involved in robbing will slow down the behavior, but not stop it. (The bees should remove the grass on their own, but make sure it is out at dusk.) Robbing normally stops at sunset and does not continue the following day unless a weak hive is involved. If you have a persistent problem with robbing, see my earlier post on robbing, or feel free to email me. Email or use the comment box below if you have any questions. This entry was posted in Removing and processing your honey crop. Bookmark the permalink. I have used the leaf blower and fume board but prefer the shake/brush method, with a helper of course. I too did not like the smell of the repellent and did not like the noise or smell of the two cycle exhaust.